Optimum Nutrition and BSN are two of the biggest and best known supplement companies around the world and both are actually owned by the Irish Dairy giant Glanbia. However that’s about the only thing the two supplement giants have in common with each company creating products that are essentially different from each other. Optimum Nutrition’s Serious Mass and BSN’s True Mass represent two of the most popular mass gaining proteins around and one of the best selling supplements of each respective company. But which one is a better mass gainer? 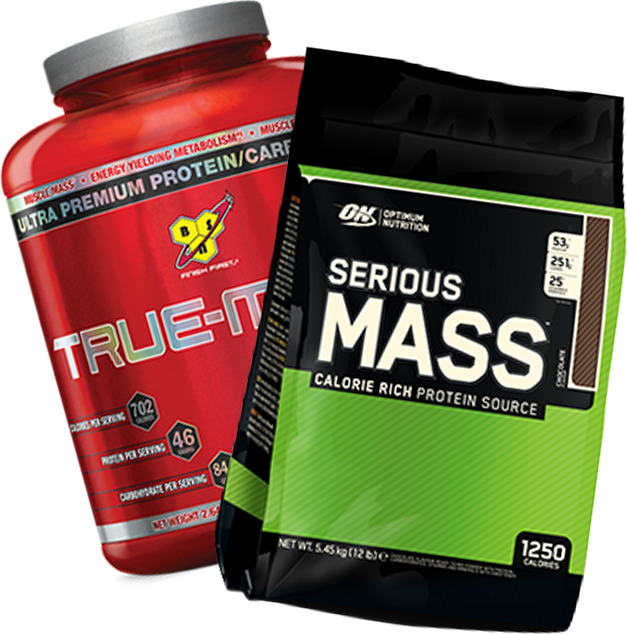 Optimum Nutrition Serious Mass and BSN True Mass are both fairly high calorie mass gainers or weight gainers. To best compare ingredients, it’s best to compare on a macronutrient level and also what major differences exist between the two supplements. Carbohydrates – The majority of carbohydrates in Serious Mass comes from the bucket load of maltodextrin in the product, being the first ingredient in the supplement. Conversely, maltodextrin is the second ingredient of BSN True Mass. Each supplement also provides carbohydrates through some of their protein sources, usually in the form of lactose. Protein Blend – Serious Mass only contains 4 different protein sources in its whey blend while True Mass offers 8 different protein sources as well as added single branched chain amino acids. Fats – Both mass gainers also provide medium chain triglycerides (MCTs) as its main source of fat. Extra Ingredients – Both protein powders contain a comprehensive spectrum of essential vitamins and minerals. After this, Serious Mass finishes off their formulation with some flavours, lecithin to improve mixability and a sweetener. 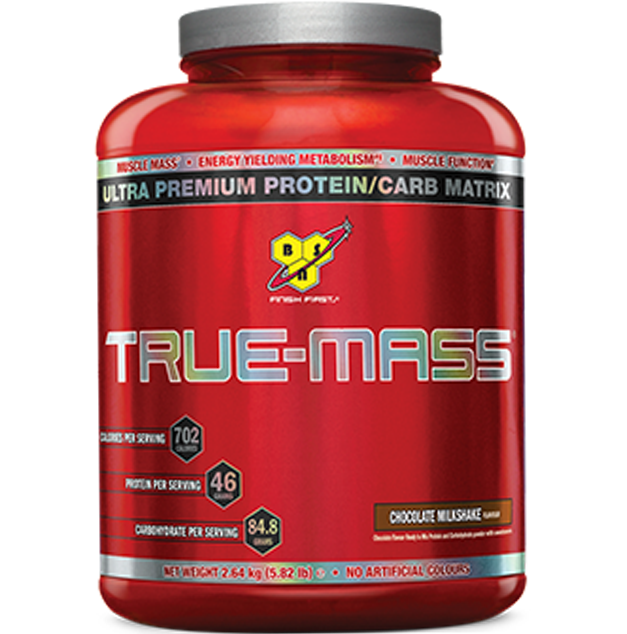 True Mass on the other hand includes some extra ingredients including polydextrose, sunflower powder, some gums and 2 protein digestion enzymes (proteases) in the form of papain and bromelain. Winner: BSN True Mass - Both supplements contain fairly similar ingredients, but the added protein sources and branched chain amino acids gives True Mass a slight edge as it helps to provide a much more even delivery of amino acids to the working muscles. However, this hardly matters since people wanting to bulk up tend to have plenty and frequent protein meals. The recommended serving size for Serious Mass is more than double that of True Mass at 334g vs 148g. As such, to truly compare the dosing of ingredients in Serious Mass vs True Mass, it’s best to compare each nutrient per 100g of powder. From the above table, you can see that True Mass provides more calories per 100g than Serious Mass with a more even distribution of protein, carbohydrates and fats. If the whole idea of a mass gainer is to help you gain mass and size, then at the simplest level, the supplement with more calories is the better option. As such, True Mass again takes the crown for this category. The key to gaining weight and bulking up is an increase in calories. Period. However, the style of weight gain that you’re after and the type of mass gain protein ideal for your body type if slightly more nuanced. Serious Mass, with its high carb content is thought to be ideal for the hard gainer who tends to have a higher metabolism and since protein is thought to have a greater thermic effect (more calories are expended in its digestion) than carbohydrates, increasing the carbohydrate content to make up for calories is one way to support gains in hardgainers. Increasing the fat content can be helpful however, you want to limit that to unsaturated fats. While True Mass may not have a huge carbohydrate percentage, they’ve utilised more fats, most of which is unsaturated. Since fat has double the calories of carbohydrates and protein, it makes sense to include more fats into mass gainers. The protein content of Serious Mass is half that of True Mass and unless the consumer was also very diligent about their diet could put the user at a higher risk of not meeting their daily protein intakes with Serious Mass. Overall, though, True Mass provides more calories, higher protein content and adequate carbs to help you gain weight, bulk up, recover and build muscle. Serious Mass does the same, but puts you at greater risk of not meeting your protein needs and because of this loses out again to BSN’s True Mass. Optimum Nutrition’s Serious Mass is available in 4 flavours including Vanilla, Strawberry, Chocolate and Banana, while BSN’s True Mass is available in an extra fifth flavour of Cookies & Cream. Both mass gainers taste great with the True Mass being slightly thicker than Serious Mass due to the presence of gums. Overall, both these supplements taste great and mix extremely well for so much powder with little residue, clumping or grittiness. While the cost per serve of True Mass is less than of Serious Mass at $5.22 vs $6.13, it should be noted that per gram of powder, Serious Mass is more cost effective, but this is probably due to the the product having more carbohydrates, which are considered cheaper than protein or fats. Regardless, Optimum Nutrition’s Serious Mass wins by a slight margin in this category. Optimum Nutrition’s Serious Mass and BSN’s True Mass are two of the most popular mass gainers and weight gainers at the moment and both have cultivated a tremendous fan base over the years. The supplements themselves stay true to the fact that neither of them resemble each other as mass gainers with Serious Mass containing more carbohydrates than True Mass, which itself has more protein, fats and calories per serve. At the end of the day, if your goal is to bulk up and gain mass, calories and quality calories are what counts. Keeping this in mind, BSN’s True Mass comes out as the winner.